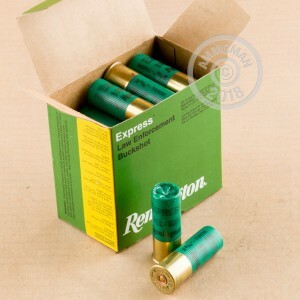 These shotshells from Remington excel in both defensive and hunting roles, all at a reasonable price. 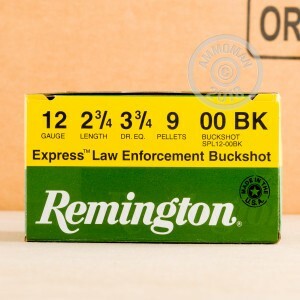 The 00 buckshot used in this 12 gauge ammo is the most common type for these purposes, and it excels in sparsely populated areas where over penetration is less of a concern. 00 buck pellets measure .33 inches or 8.38 millimeters in diameter. Each 2-3/4" shell in this box of 25 fires nine pellets of 00 buck at a muzzle velocity of 1,325 feet per second. This "express" load results in excellent penetration and good effective range. However, novice shooters may find the recoil of these shells somewhat difficult to manage effectively at first. The 2-3/4" shell length fits virtually any 12 gauge shotgun. 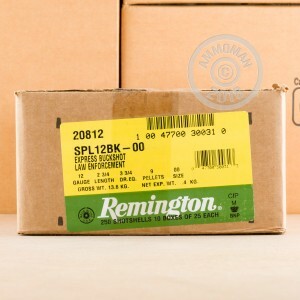 Remington is one of the oldest ammo manufacturers in the world, with experience in producing a wide variety of firearms and ammunition. These shells are loaded in Lonoke, Arkansas.